As of Jan. 12, OmniTrans sbX bus riders can commute quickly on Saturdays from 7 a.m. to 9 p.m. Bus stop on Cal State San Bernardino Campus. OmniTrans is a suitable eco-friendly quick fix for getting to destinations because of its fast, pleasant and low-cost option to avoid traffic. The economic bus gets passengers where they need to be in a safe manner. The Federal Transit Administration has gone as far as extending the road on an existing highway specifically for buses. The FTA guarantees their projects will have the least negative effects on the surrounding communities. The transit service departs from the university bus stop on University Parkway every 20 minutes and makes multiple stops on Little Mountain, Baseline, the Inland Center, Hospitality, Tippecanoe, Redlands Boulevard and Anderson until it reaches its final destination, Loma Linda Veterans Hospital on Barton Road. Also, the new service can be beneficial for everyone in the community. For those who ride with OmniTrans, they can travel safer and quicker on the weekends. For those who do not will find it beneficial regardless because it could lessen the chances of traffic due to fewer cars on the road. The local residents will have transportation to places all over the city, plus more. There are routes that take a rider to the Metrolink station and transfer stations. Another benefit goes towards the environment. Fewer cars on the road mean fewer emissions in the atmosphere. Public transportation saves energy and improves air quality. Two buses heading away from the Cal State San Bernardino Campus. 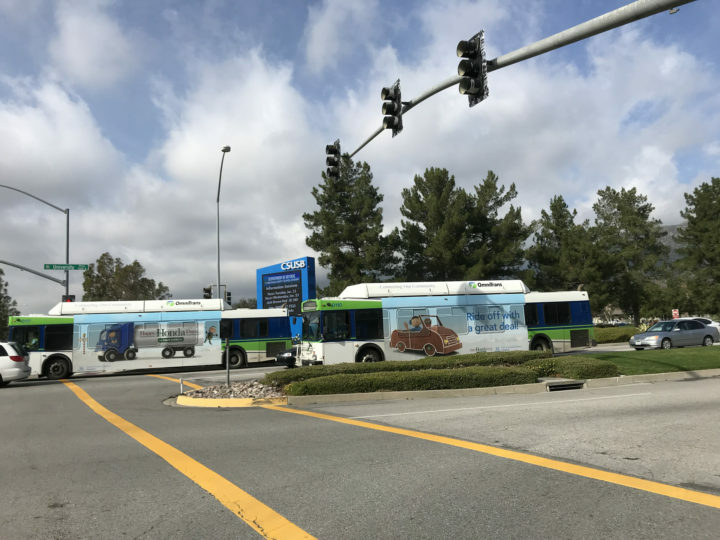 OmniTrans sbX serves as a convenient transportation option for CSUSB students. With valid student ID’s, students can ride for free. 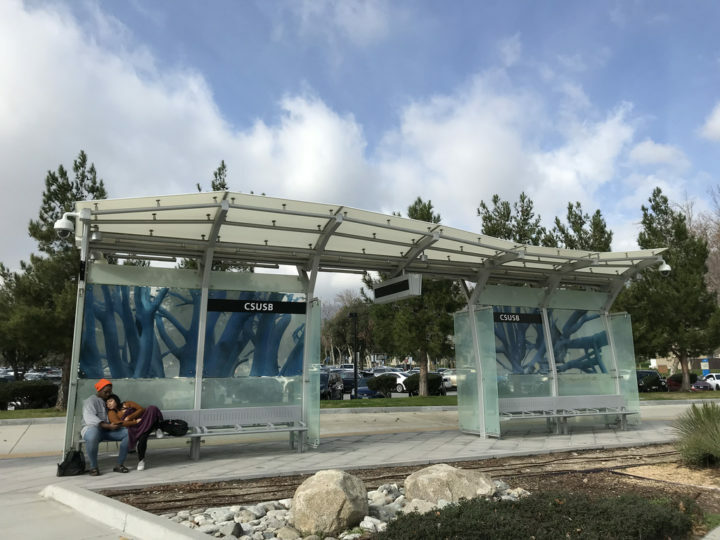 The bus stop on University Parkway is just a quick walk from any CSUSB building. It is well lit and has plenty of room for students to wait. Having the bus stop in front of the school gives students who are unable to commute on their own the chance to attend. OmniTrans will be offering free rides on January 19th and 26th for the 16-mile line. Also. starting February 2nd, rides will be $1.75 for a single ride, or $5 for an all-day pass. Services will be available in San Bernardino and Loma Linda. This information is really well presented and great to know. This will really benefit many students.